Canadian home sales barely budged last month according to the latest numbers from the Canadian Real Estate Association (CREA). After five straight monthly declines, Canadian home sales eked out a 0.3 per cent increase between January and February. 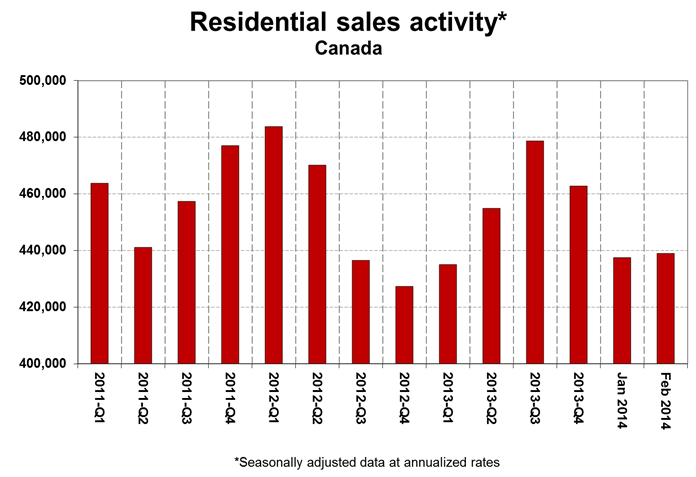 Actual home sales for the month rose by 1.9 per cent over February 2013. As it stands, the sales activity for February is 9.3 per cent below the market peak reached in August 2013. Prices continued their upward climb in February. The national average sales price for homes sold in February 2014 rose 10.1 per cent year-over-year to $406,372. Meanwhile, the MLS Home Price Index rose 5.1 per cent in February 2014 over February 2013. CREA describes the MLS Home Price Index as a better gauge of price trends as it is unaffected by changes in the mix of sales activity the way that the average sales price is. The national average home price is expected to rise to $397,000 in 2014, an increase of 3.8 per cent from a year earlier. The national listings outlook would have declined, were it not for a large increase in new listings in the GTA. Instead, there was a 0.6 per cent month-over-month increase in listings across Canada. The GTA pulled the national average up thanks to its 7.8 per cent increase in new listings. The increase comes after a particularly tight January — listings in Toronto had declined to their lowest level in more than three years. However, other large markets, such as Greater Vancouver and Edmonton, recorded a decline in new listings. Two-storey single family homes saw the biggest price gain, rising 5.84 per cent year-over-year. Single-family homes measured 5.4 per cent price growth. Townhouses/row units rose at 4.05 per cent, and apartment units at 3.74 per cent. Apartment unit price increased 3.74 per cent from February 2013. Calgary saw the greatest year-over-year price growth with the MLS HPI skyrocketing by 9.1 per cent. 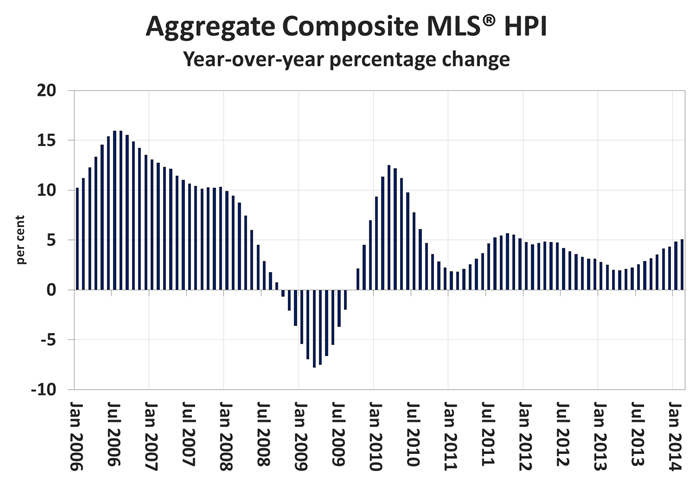 Greater Toronto followed with a 7.28 per cent bump in the MLS HPI. Greater Vancouver recorded a fourth consecutive year-over-year increase with a 3.17 per cent increase. Victoria’s February decline of 1.01 per cent was actually the city’s smallest decline in more than three years.